After 10 months I’m just getting to the point where I feel like I have the energy to do something outside of being just Mama 24/7. About once a month another Mama friend and I get together for a mama and baby day, and K suggested incorporating our Pinterest crafts into our monthly playdates, and I loved the idea. Two birds – One stone type of thing, which is right up my alley (multi-tasker right here). We get to both have a play date for the kiddo’s as well as spend some time with another Mama and do an adult activity. So since it was her idea, she got to pick the craft – last month was Menu Boards, which happened to be a craft that both of us had pinned – perfect! Here’s what I ended up with – not too bad for an hours work. Thankfully J actually took a 1+ hour nap that day…miracle! K and I shared our favorite recipes and we ended up with 30+ recipes each to start out our boards with. I’ve really been trying the last few months to both shop smart when I go to the grocery store – bring a list and shop the sales – and to plan our meals at least a week in advance (which also helps with the list part). 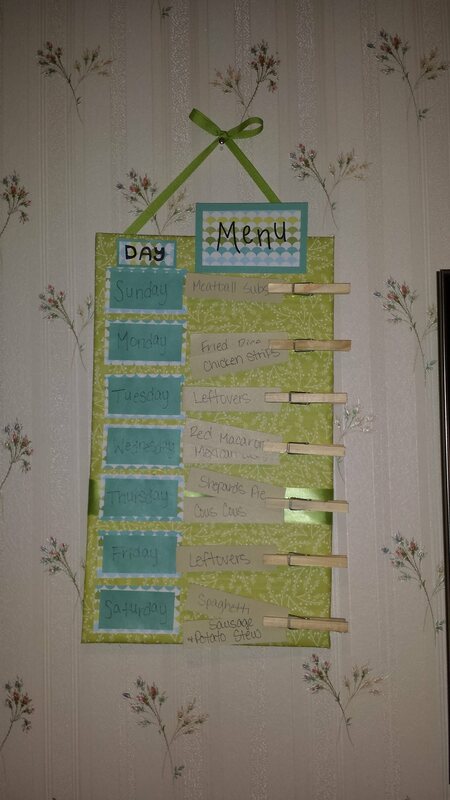 This menu board was a perfect addition to my shop-savvy plan. So far, it’s been working out great. Granted we don’t follow it to a “t”, but it lets me know what food I have in the fridge and what our meal options are for the nights that we are cooking in. Added bonus – it gets us out of our usual same-3-meals-a-week pattern. There are a TON of other ideas out there for menu boards too so there’s something out there for everyone – even if you aren’t particularly crafty. Check out Pinterest (duh) for ideas.